Vietnamese Guest Chef Whips Up a Vietnamese Feast! In conjunction with Vietnam’s National Day on the 2 Sept this month, LINK All Day Dining at Pullman Kuala Lumpur Bangsar embraces authentic Vietnamese cuisine at the restaurant from 19 to 28 September, 2014. 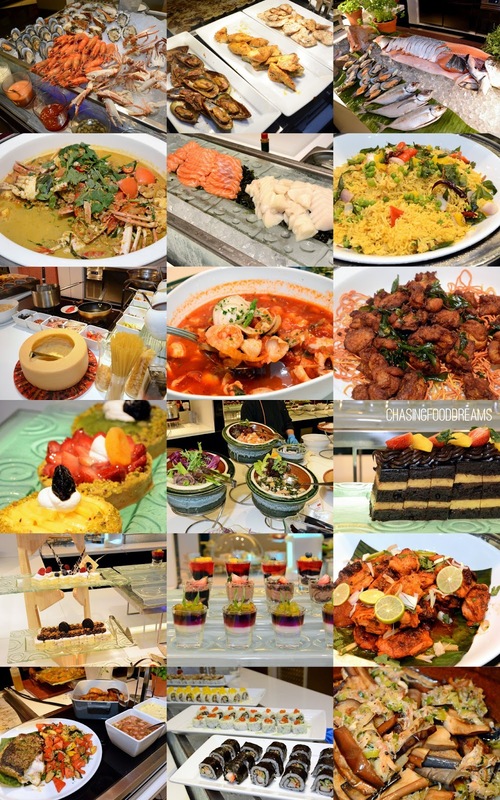 Going all out, Pullman Kuala Lumpur Bangsar launches the 10-day Vietnamese Food Promotion by spreading out an array of authentic Vietnamese delicacies buffet style. Vietnamese cuisine is known to the food lovers as a cuisine featuring the harmony combination of five distinctive elements of taste senses, namely spicy to represent metal, sour to represent wood, bitter to represent fire, salty to represent water and sweet to represent Earth. It can be simple and yet complex in flavours. It is an honest and down-to-earth cuisine that utilizes local ingredients found on the soil of the country. Distinctive ingredients such as fresh herbs, vegetables, fish sauce, citrus fruits, garlic and chili are mostly present in Vietnamese dishes. Wikipedia quoted that Vietnamese cuisine is considered one of the healthiest cuisines worldwide. Street food contributes a huge part of the Vietnamese cuisine. Famous street food easily recognizes all over the world are Bánh mì, Phở and Vietnamese Spring Rolls. Vietnamese Chef Viet Anh Nguyen and Miss Diue Anh Nguyen are brought in to ensure that diners are treated to authentic and wholesome Vietnamese cuisine at Link for this Vietnamese Food Promotion. Chef Viet showcases dishes from North to South in his menu. Miss Diue briefed that Northern Vietnam cuisine tend to head towards more sour flavours while Southern is very vibrant in all five flavours of sweet, spicy, sour, bitter and salty. Fresh Spring Rolls (Goi Cuon) and Deep Fried Spring Rolls (Cha Gio) are extremely popular street food that is literally available everywhere in Vietnam. While Fried Spring Rolls are eaten in the North, Fresh Spring Rolls was said to have started in the South of Vietnam where the weather was hotter and humid, leading everyone to savoring fresh ones that is lighter. The Fresh Spring Roll and Fried Spring Rolls are always eaten with the nước chấm, a fish sauce based infused with raw garlic and chili dipping sauce. I was thoroughly in love with both rolls, savoring countless rolls after rolls that night, all freshly prepared by Chef Viet himself. One is light and fresh while the other is juicy, crispy and flavourful! There is also Bánh xèo, a Vietnamese crepe made from a batter of rice flour, turmeric, and coconut water, fried to a crispy crepe and topped with a filling of meat or prawns with bean sprouts and other vegetables. The version here is very delicious. Crispy thin edges, fluffy middle and studded with a lovely savory and sweet filling of prawns with crunchy bean sprounts. Phở noodles are simply a must-have in any Vietnamese meal. Equivalent to our local noodles, Phở is crucial in Vietnamese cuisine like Kimchi is to Korean cuisine. It is basically a street food that is enjoyed for comfort. Though there are many variations of Phở, it is basically a noodle soup with a linguine rice noodle in a meat stock enhanced with lots of fresh herbs and onions. Chef Viet has prepared a Chicken Phở and a Beef Phở for his daily menu. I topped mine with lots of fresh spring onions, cilantro, chili, lime and fish sauce. It is such a comforting bowl of noodle soup that never fails to satisfy my satiation. Besides the famous street food, Chef Viet has also whipped up Vietnamese dishes to be enjoyed with rice. The Stewed Beef in Coconut Juice and Green Pepper is pretty good. Cooked for hours in coconut water with green peppercorn before being topped with creamy coconut milk, the stew has a unique flavour with a creamy and peppery note. There was also the Wok Fried Chicken Wings with Sweet and Sour Fish Sauce. I enjoyed the Grilled Squid with Lemongrass and Chili for its aroma and distinctive lemongrass flavours with a spicy twist. Grilled Eggplant with Crab Meat is also very good. Smoky soft grilled eggplant is sweet and delicate in flavours while the crab meat added another level of sweet ocean flavours to the delicate eggplant. I also tried the Vietnamese Seafood Soup, a seafood stock that renders sweet and sour flavours. It is very appetizing with each sip of the soup while pieces of pineapple, tomatoes and other vegetables together with fish sums up the flavours and textures of the soup. I can really taste the pineapple flavours in this soup. Of course besides the Vietnamese corner which features different dishes on rotation, there are also plenty of other local and international dishes in the buffet! 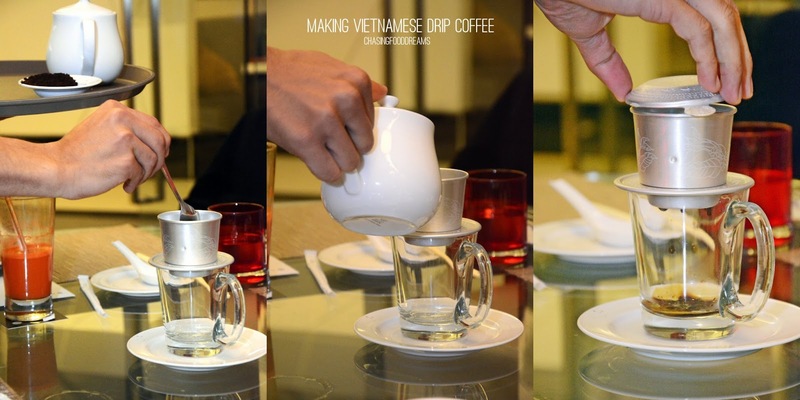 Now the Vietnamese are very proud of their Vietnamese Drip Coffee. It has a very strong and bitter note of coffee beans and is usually savored thick bodied. It’s not my first time having this as I used to drink a lot of it during my college years. Here it is served the traditional way, where coffee is put into the Vietnamese drip coffee maker, weight down with a weight and hot boiling water is pour into it, letting the maker steep the coffee and drips it from underneath into a cup. It takes a good few minutes of waiting but the result is worth it if you happen to love strong coffee. Though there are many desserts available, there is a special Vietnamese Drip Coffee Cake that one must try! It’s a cake that is flavoured with the Vietnamese Drip Coffee combined with chocolate. We love this cake very much as it resembles a luscious deep chocolate mousse with a heavy coffee essence. LINK’s Vietnamese Promotions runs from 19 till the 28 of September 2014 for both lunch and dinner buffet. For further information or reservations, please contact LINK All Day Dining at 603 2298 1855.